It’s looking to be another stellar week in the PlayStation Store, with great content coming for both your PS Vita and PS3 systems today! We start with the launch of Resistance: Burning Skies for PS Vita, which ushers in a new era of portable first-person shooters. With dual-analog control, robust multiplayer features and amazing weapon functionality, this is one chapter in the Resistance universe you won’t want to miss, so be sure to download your copy today from the PlayStation Store. RipStone’s Pure Chess offers something for players regardless of skill level. 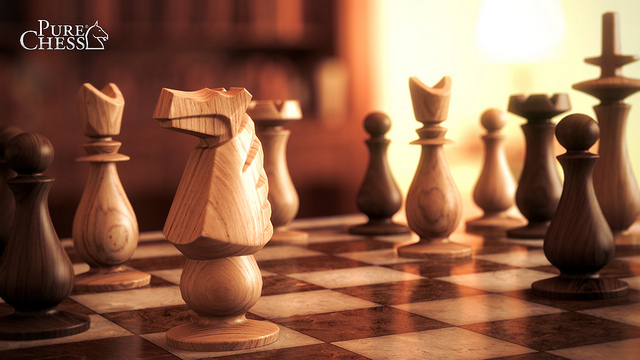 If you think of yourself as a chess master, match your wits against the genius AI. With gorgeous looks, asynchronous multiplayer, and amazingly detailed environments to play in, this timeless game finds a whole new life. This awesome game is available today on the PlayStation Store for both PS Vita and PS3. There’s even more must-have downloads for PS Vita owners this week, with the new Nico Nico app and the Gravity Rush demo. With Nico Nico, watch videos from both professional and enthusiast broadcasters. Go to niconico.com to learn more and be sure to download this free app on to your PS Vita today. You can also get your first hands-on playtime with the highly-anticipated PS Vita action-adventure game Gravity Rush. Try this game our for free before it hits shelves on June 12th by heading to the PlayStation Store today. For those looking to build up your game collections, we’ve got great news: This week we introduce PS3 Ultimate Editions, and to kick things off we’re having a sale on a variety of PS3 Full Games, which come complete with all of their DLC. Choose from hits like inFAMOUS 2, Call of Duty: Black Ops, Just Cause 2, Mortal Kombat and more, all available at 30% discounts (50% for PlayStation Plus members)! Keep a look out for other great content on the PlayStation Store today including the PSN game Mad Riders and the PS2 Classic Rayman Arena. Make sure you check out all the details below and let us know your thoughts in the comments or join the discussion on the PlayStation Community forums in the Official PlayStation Store Update thread. Don’t have PlayStation Plus? Click here to purchase your membership today! Mad Riders is an adrenaline-fueled off-road arcade racing game that sets new standards for the racing genre on PlayStation Network. Experience the game of chess like you’ve never seen it before. Download Pure Chess to see how stunning and beautiful chess can really be, and find out if you are a Grandmaster in the making. Experience the game of chess like you’ve never seen it before. Download Pure Chess® to see how stunning and beautiful chess can really be, and find out if you are a Grandmaster in the making. As New York fire fighter and National Guardsman Tom Riley, you’re about to come face to face with the brutal Chimeran invasion force in this blistering shooter built from the ground up for the PlayStation Vita. In Assassin’s Creed Revelations, master assassin Ezio Auditore walks in the footsteps of the legendary mentor Altair, on a journey of discovery and revelation. The critics have spoken – “Rayman Origins is Living, Breathing Perfection” -Gamefan. 9.5/10 – IGN, 9 /10 – PlayStation The Official Magazine, 9/10 – Destructoid, 5/5 – Joystiq, 4.5/5 – Gamepro. Download the demo for Mad Riders now! Mad Riders is an adrenaline-fueled off-road arcade racing game that sets new standards for the racing genre on the PlayStation®Network. Perform aerial stunts, use your boost wisely, and open shortcuts to dominate your friends on 45 tracks in stunning tropical locations across the globe. Manipulate gravity to save your world from destruction. Gain a new perspective as you take on the role of Kat, a strong-willed girl seeking the means to protect her future in a world that’s crumbling to pieces. Tilt and move the PlayStation Vita, taking gravity into your own hands to deliver devastating attacks, uncover the secrets to your past and explore a mysterious world. As New York fire fighter and National Guardsman Tom Riley, you’re about to come face to face with the brutal Chimeran invasion force in this blistering shooter built from the ground up for the PlayStation Vita. The latest installment in the hugely successful franchise focuses on the initial days of the assault by overwhelming Chimeran forces on the U.S. eastern seaboard and intense multiplayer. Download the trial today and experience portable shooting redefined! The Rebellion Multiplayer Expansion opens two new fronts against the Reapers: Firebase Jade’s jungle reservoir and Firebase Goddess on Thessia. New DLC for ELEVATOR ACTION DELUXE has arrived! This update gives you five new stages to explore and master. Sneak or fight? Disguise is the key to success in these stages! Put an end to the enemy’s ambitions! Will you rise to the challenge? Download the Starhawk Costume Minipack to dress your Sackboy in these exciting costumes: – Emmett – Cutter – The Outlaw To download this costume pack, you must already own LittleBigPlanet 2. Introducing the “Excessive Force” Pack, the most insanely over-the-top pack Radical Entertainment® has ever created!! “Excessive Force” is about to become your middle name. Check out all the Pure Chess additional content available for download. Each pack contains a stunning new location and incredibly detailed set of chess pieces. This pack features an Autumnal park and an ornate set of park animal chess pieces. “BULLET FOR MY VALENTINE PACK 01 ($5.49) – Build your Rock Band library by purchasing this song game album: BULLET FOR MY VALENTINE PACK 01. This pack includes “Scream Aim Fire”, “Tears Don’t Fail” and “Your Betrayal”. By Bullet for My Valentine. Hop into the arena or race to the finish against your opponents in this Rayman-themed party game. Time for some Burning Skies! The posts complaining about the Rayman Origins price change are coming. Why is APE ESCAPE not on PSone classics yet? It was a first party title and was one of the most popular PS1 games. COME ON! Pure Chess! Finally. Great update! Sweet, but I have 26 cents less than I need to buy LA Noire Complete Bundle (whats currently in my wallet)…depressing. Oh well, I might get Just Cause 2, or just keep the money in my wallet until the Close Quarters expansion for BF3 comes out. Thanks for the early updates Grace; appreciated ! Great Vita update! Already picked up Resistance from retail and can’t wait to get Gravity Rush Demo, Niconico and pure chess. Can’t wait to see what’s in store for the Vita @ e3! Can we get the JUNE PS+ Preview please? Still no ghost recon future soldier??? It hit the euro store last Thursday. If we Buy Pure Chess for PS3 or Vita, do we get the other version for the same price, or do we have to buy it twice? I didn’t see any mention of a 2 version deal on this one in the Pure Chess blog post that went up earlier, so I don’t believe this is in effect. Could we get a list of the DLC with the Ultimate editions? Also, great update. I do hope you guys plan on the promised mid night releases for Vita games though…. I don’t like the recent trend. and why the price for rayman origins is not 15$ ???? We’ll work on getting the Plus outlooks tighter. I know the original Plus Post stated $15, and as mentioned in those posts, the content and pricing is subject to change; but this was one of those pieces that did see some change. Apologies on this one. I have noticed that a few more PSP Legacy games now seem to work on the Vita (though only by downloading them to a PS3 and copying from there). These games include titles like Sega Genesis Classics, NCAA Football 2010, and Myst. However, some games like Midway Arcade Treasures and Hakuoki are not transferrable. Is there a full list of compatible games, so that I can purchase titles with the knowlege that it will work on my system? Also, when will PSOne Classics be enabled on the Vita? I am quite looking forward to playing the Crash games and Legend of Dragoon on my Vita, and would like to know if plans are still in effect for this feature to show up. Thanks for your time, and looking forward to the new Vita demos posted today. I’m with JoeTheBeast16, do we get both for that price? Thx for the update! Can’t wait to play more Arkham and the GRR demo. btw what DLC does the inFAMOUS 2 Complete edition contain? Nice to hear that GR is only 40 but is there going to be a discount on the store for it? Also, I’m very disappointing in the PSN marketing team. PS3/Vita content on PSN should be bundled for $60. thats a $20 dollar discount and consumers can’t sell it back. theres no game cases or anything or no codes to sell, why can’t this be done? 5)Maybe integrate SOME of the above with PS Plus. 7)Get game trailers up faster…. Well thats all I can think about now but please relay the ideas. Thanks and have a good day! 1. What happened to my 1 month FREE Plus with my purchase of Starhawk at GameStop? 3. I thought Rayman Origins for Plus Members was going to be $15.00 for Plus members? And why is it that via the PS3 Store, A Space Shooter for 2 Bucks is listed as Vita compatible, yet it will not transfer to my Vita? AC Revelations is $60 ? Naw, come on..
Thankfully I picked it up new (with AC1 included) for $19.99 last month. Excellent update! but… the frees stuff for plus members? its been a while since the last time i saw a classic for free, like 3 weeks, and its a lot if we considered that was something of almost every week. With the exception of the online pass, it looks like a nice update. Someday you should give the Vita some PlayStationn Plus love. I know the pass only exists to punish the used game buyer, not the original game purchaser. why is resistance burning skies full price on psn? Oh come on guys last months Rayman Origins was shown off at $15, for the past three weeks I’ve been saving the $16 I had left in my wallet for Rayman and now I don’t have bloody enough? Chess looks good probably get that. Where on earth is Machinarium for PS3 though? Resistance Burning Skies: Store says 3.1GB required, post says 2.84GB required….which one is it? Luckily i bought rayman origins for 15 bucks at fred meyer 3 months ago! Nothing special… the “Ultimate Deals” thing is pretty neat though. Early’ish updates are always a plus too. Next week is apparently going to be huge. 3GB demo for Resistance? Awesome for 4GB memory card Vita owners. Glad to see its full retail price too, none of that 10% mess other Sony digital titles received. Really Sony? Still no DLC tables for The Pinball Arcade? I hate to sound entitled or whatever but that’s unacceptable. Farsight has said the DLC is finished and it’s in your hands so what’s the hold-up? I imagine it can’t take this long to authorize and publish to the store. You guys sure don’t take this long to authorize weekly Rockband tracks or CoD maps do you? But when it comes to an indy game you take your time? :/ Sup with that? I hate to sound rude and that’s really not my intention but I just would like to know. Thanks. So the Rayman Origins plus price isn’t $15 after all. Too bad. Guess I’ll wait for a better offer. I can wait. Well, only Just Cause 2 for me this week, then (great deal, by the way). would someone please explain to me why games on PSN store for Vita cost the same as the retail version? i thought they were supposed to be 10% less on PSN than retail.. i mean they indeed were at launch but why not now? 60$ for assassins creed revelations? What a joke. Hasn’t been 60$ in retail stores for months. Should be 40$ at most…..
Also PSN will never get the masses of its consumers to buy Digital when you charge outrageous prices that are way higher that what is being sold in retail stores at much lower price. Yeah, I was thinking about grabbing Rayman at $15, and I know it’s only $8 more, but, now I’ll hold off. Curious as to what happened there. As others have asked: Why is Resistance, a FIRST PARTY game, full price on the PSN? We were told there would be a discount day and date for all first party titles if purchased on the network. To contribute, though, I will ask a gripe-type question. Is there a reason some PS3/Vita games are available on both systems, as a buy one, get two feature, while others aren’t? Pure Chess looks great, and I plan on getting at least the Vita version. At $7.99, it’s a great deal, and gamers have been fortunate enough to get two versions of an identical/similar game so I can’t complain. So this is merely a question about why some offer this while others don’t. It would be nice to buy the DLC just once, for example. Also, I like these Ultimate Editions. They shouldn’t be a promotional feature, and should expand to every game with DLC that has been out for some time. This would push a lot more content, as I recall taking advantage of a Borderlands bundle a while back. – It is NOT “buy one, get both”. You have to pay for each version. That being said, why is the add-on more expensive for the vita version? – Rayman Origins was supposed to be $15. What happened? Still no ” Walking Dead Episode 2″ PSN game update? Now this is starting to get annoying.. does anyone know when the next episode of the Walking Dead comes out? when does jet set radio come out? I just literally put a $20 card in my wallet… I don’t think it’s going to be enough… Haha.. keep the updates coming…. Dammit Sony! $23.99 for the Rayman Origins? You are doing it wrong!